My thanks to my friend Eileen, for alerting me to this meaty segment on writing about food from ABC Radio National’s Book Show. More surprising than I had expected, it’s a nice energetic discussion on fictional, poetic and other writerly food between Stephanie Alexander (whose new book The Kitchen Garden Companion I absolutely lust after), John Newton and Gay Bilson with Ramona Koval. Gay Bilson is particularly literate, erudite and thoughtful. She’s a very interesting woman, I think, given her stepping away from her massive success as a restaurateur (Berowra Waters Inn, etc) into a more reflective, quieter and far more ascetic sort of life these days. As a result of this interview I shall be seeking out her own books, Plenty and On Digestion. She also writes for The Monthly, and has a strangely moving piece in this month’s issue about organ donation which begins by evoking mushroom harvesting. She is intriguing, I reckon. The beloved MFK Fisher comes in for a surprisingly acerbic serve from both Gay Bilson, who says Fisher’s writing is self-regarding and “makes my toes curl” and Stephanie, who calls her writing mannered and says she gets the feeling of indigestion from Fisher! A good lively, highly literate discussion all round, liberally sprinkled with food quotes from Sybil Bedford, Hemingway, Ian McEwan, Henry James, Lawrence Durrell, Anita Brookner, Frank Moorhouse and invoking The Magic Pudding, Enid Blyton and lots more. Download it or listen online here. I’ve never actually cooked anything out of The Taste of France based on a Sunday Times magazine series from 1983 because the food all looks a bit dark and the layout’s confusing. But the photo of a chipped pottery bowl filled with three kinds of wild mushrooms, five eggs still in their shells and an old wooden spoon holding sea salt, ground pepper and garlic cloves is fantastic. It doesn’t immediately make me want to make scrambled eggs with mushrooms but it does make me want to rent an old house in the Auvergne, in October (mushroom season), shop at the markets for my eggs and butter and then make the recipe. It’s just something a white-styled Donna Hay book can’t do. 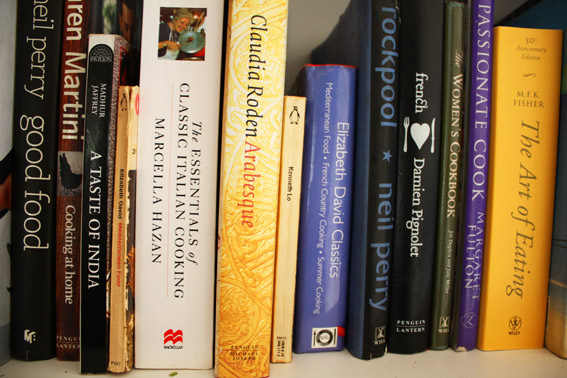 Just listened to the good ol’ Book Show on Radio National, to a piece I missed a little while back with Helen Greenwood, a very experienced food writer who, among her other many gigs, apparently teaches workshops in writing about food. I’ve actually been toying with the idea of having a crack at teaching such a workshop myself (about food in fiction, only), but from what I hear Ms Greenwood probably does it better. In this interview Helen pretty much covers what is so riveting about grub – not just the eating, but its tendrils into everything else that’s important: history, art, culture, medicine, love, conflict, ethics, death, emotion, memory … no wonder what’s on the plate is so endlessly interesting to mind, body and soul. Anyway, check out the audio of Helen Greenwood’s interview here – and as I twirled around the net after Ms Greenwood, I came across another good bit of her work here, in a review* she did quite a while back for the SMH of a brilliant-sounding anthology of food writing, rather boringly titled Choice Cuts: A Selection of Food Writing from Around the World and Throughout History. But though the title may be dull as dishwater, the book itself sounds excellent – one for the Christmas list I say, if it’s still around. *I have to say the first line of this review, where Ms G takes anthology editors gently to task, gave me a leetle shiver; ours is out in November and I’m the editor who might be copping it – yeek… but you know what? I don’t reckon I will. Because the stories in our book, Brothers & Sisters, are fricking gold. Take one Nam Le, mix with one Cate Kennedy, one Tegan Bennett Daylight and a Christos Tsiolkas, and blend with one Robert Drewe, a Roger McDonald, an Ash Hay, a Tony Birch, an slug of newness a la Virginia Peters & Michael Sala, rounding off with a sprinkle of One, and I say that is one impeccable recipe. Oh, how a metaphor can be stretched and mangled. Believe me, though – unlike this blather of mine, the book is a cracker. Does anyone in Australia understand the Julia Child adoration thing, or is this purely an American phenomenon? I have known virtually nothing about her except her name – but in the New York Times this week is a long and lovely essay by the wonderful Michael Pollan about Julia Child, the first American TV chef, prompted by the new movie Julie & Julia, starring Meryl Streep as JC. He muses about the changes in American home cooking and the influence of television upon it, starting with the way Julia Child apparently liberated a generation of American women from fear of cooking by dropping a potato pancake and then retrieving it and patching it back together – her show was live TV, after all. Pollan is such an engaging writer (his book Second Nature, about gardens, was a big influence on me as I wrote my second novel The Submerged Cathedral, and his other books on food production and ethics, In Defence of Food and The Omnivore’s Dilemma, are just as lively and provoking), and this essay is a beauty. Pollan’s essay goes on to discuss the exponential rise of television cookery, and how American studies show that people spend more time watching cooking being done than doing it themselves (particularly interesting given the popularity of Master Chef here, and the talk about how it’s supposedly got people back into the kitchen. I wonder…). These shows stress quick results, shortcuts and superconvenience but never the sort of pleasure — physical and mental — that Julia Child took in the work of cooking: the tomahawking of a fish skeleton or the chopping of an onion, the Rolfing of butter into the breast of a raw chicken or the vigorous whisking of heavy cream. By the end of the potato show, Julia was out of breath and had broken a sweat, which she mopped from her brow with a paper towel. (Have you ever seen Martha Stewart break a sweat? Pant? If so, you know her a lot better than the rest of us.) Child was less interested in making it fast or easy than making it right, because cooking for her was so much more than a means to a meal. It was a gratifying, even ennobling sort of work, engaging both the mind and the muscles. You didn’t do it to please a husband or impress guests; you did it to please yourself. No one cooking on television today gives the impression that they enjoy the actual work quite as much as Julia Child did. In this, she strikes me as a more liberated figure than many of the women who have followed her on television. He also notes that Julia Child began her cooking show in the same year that Betty Friedan published The Feminine Mystique, and points out that although they could have been seen as adversaries, this wasn’t true: Child had an aversion to the word ‘housewife’ and treated cooking as a skill and an art, rather than another bit of household drudgery for women. Anyway I could go on and on – but better for you to simply read this excellent essay here. Then discover more about Julia Child here (or this fab Youtube video of her show here – it’s hilarious), and more here about the Nora Ephron movie (which in the way of this strange new world, originated from a blog. Yes, a food blog, called the Julie/Julia Project.). I just watched the movie trailer and confess that I can’t wait! Two more amusing additions to this post must be made. First, this link to the beautifully narky Regina Schrambling at Slate, on ‘Why you’ll never cook from Julia Child’s Mastering the Art of French Cooking’. And second, rather more entertainingly, The Defamer’s round-up of cranky food bloggers and their snooty dismissals of Julie Powell, the blogger whose work started the whole JC revival. Hilariously chock-full of envy and rage at their fellow blogger’s success, this stuff makes for rich reading. One namedropping post by a ‘trained chef’ even says, with disgust, “People who happen to eat and are able to type are now our new food experts”. Seems rather to miss the point of Julia Child’s taking cookery to the masses, no? Not to mention that the remark is written by a food blogger. Anyway, all good for a laugh and found here. I’ve just taken Jonathan Franzen’s The Corrections down from the shelf, again, because I’m at a reading loss, with nothing good enough to replace The Line of Beauty coming my way yet (suggestions, anyone?). Tried earlier today to buy Hilary Mantel’s Beyond Black, as my writing pal E showed me a bit of it last night, and lordy that woman can write. But no joy in the shop. Anyway, I have once again come across this superb mealtime encounter between abrasive Denise, a chef, and her ageing parents Enid and Alfred. It starts with Enid’s description of a lavish party. “I’m sure it was very nice,” Denise said. The subtle signs that Denise was exercising patience – the slightly deeper breaths she took, the soundless way she set her fork down on her plate and took a sip of wine and set the glass back down – were more hurtful to Enid than a violent explosion. “I’ve seen tall desserts,” Denise said. Enid had, true enough, had fun at Dean and Trish’s party, and she’d wished that Denise had been there to see for herself how elegant it was. At the same time, she was afraid that Denise would not have found the party elegant at all, that Denise would have picked apart its specialness until there was nothing left but ordinariness. Her daughter’s taste was a dark spot in Enid’s vision, a hole in her experience through which her own pleasures were forever threatening to leak and dissipate. “I guess there’s no accounting for tastes,” she said. “But most people are wrong,” Denise said. “You sound like a snob,” said Enid. Denise straightened her back and raised her glass. Enid, who all her life had been helpless not to observe the goings-on on other people’s plates, had watched Denise take a three-bite portion of salmon, a small helping of salad, and a crust of bread. The size of each was a reproach to the size of Enid’s. Now Denise’s plate was empty and she hadn’t taken seconds of anything. “Is that all you’re going to eat?” Enid said. “Well, don’t lose any more,” Enid said with the skimpy laugh with which she tried to hide large feelings. Alfred was guiding a forkful of salmon and sorrel sauce to his mouth. The food dropped off his fork and broke into violently shaped pieces. Today I came across this, by an American poet called Mark Strand who, in my vast ignorance, I had never heard of. I love this poem, despite not really understanding, or being able to say why it takes me …. It is from his Selected Poems – and there’s more about Mark Strand and his poetry here and here. Turns out my ignorance is even greater than I thought – he has been a Pulitzer winner as well as American Poet Laureate, and very distinguished all in all. I am going to buy one of his books now, in the hope he doesn’t mind my reproduction of his strange and disturbingly beautiful poem here. As I’ve said before, Cate Kennedy has a new book coming out soon. It’s a novel, and I keep hearing from advance readers (those folks who get to snaffle up the advance copies of books that are sent out to bookshops, media and so on before they are actually in the shops) that it is a right cracker. Cate is well known as a short story writer of particular note, and her collection Dark Roots was widely acclaimed a couple of years back. So I can’t wait to read this novel of hers, called The World Beneath, but I, like you, will have to wait till September to do so. But back to Cate. Apart from her writing (did I mention her amazing story for our Brothers & Sisters story collection, out in November?) she is a primary producer of another sort – garlic. A few weeks ago I got the lovely surprise of a heap of baby garlic in the post, sent by Cate after reading of my garlic-growing anxiety here ( I killed the other one, by the way). Since then I’ve potted the bub bulbs into these peat pots, and as soon as the painters finish the frame of the bathroom window, directly above my new herb bed, these will go into the bed too. It’s the only spot in the garden that gets year-round sun, although only for a few hours a day in winter. Come summer though, that spot will be hot hot hot and perfect for herbs and, I hope, the garlic. So here’s to Cate, her Dark Roots and her New Shoots.